With H hook, Ch 51, 57, (67, 77, 83), Turn. Row 1: SC in 2nd ch from hook, and in the next 24, 28, (33, 38, 41) chains, Switch to I hook, HDC in next 14, 18, (23, 28, 31) chains, Switch back to H hook SC in last 10 chains, ch 1 (Chain one does not count as SC now or ever), turn. Row 2: SC in BLO of first 10 stitches, Switch to I hook, HDC in next (14, 18, (23, 28, 31) HDC stitches, switch to H hook, SC in BLO of last 24, 28, (33, 38, 41) sc stitches, ch 1 (Chain one does not count as SC now or ever), turn. Row 3: SC in BLO of next 24, 28, (33, 38, 41) sc stitches, switch to I hook, HDC in BLO of next 14, 18, (23, 28, 31) HDC stitches, switch to H hook, SC in last 10 SC stitches, ch 1 (Chain one does not count as SC now or ever), turn. Row 4-27, 30, (34, 38, 41): Continue rows 2 and 3. On last row, finish off, weave in end. Fold crocheted rectangle vertically, and whip stitch from top unfolded area down 12, 14, (16, 18, 20) stitches on each side seam. Chain 150 to create a draw string. Thread chain on big needle, and weave it through top of soaker and tie in front. I will freely allow anyone to make items from my patterns to sell. I only ask that no one sell my patterns, or try to claim them as their own. I also ask that anyone selling from items they crochet from my patterns would post a link to my free pattern within the listing. I do think anyone purchasing crocheted items deserves the right to know that they could make it for free, also. I have noticed listings from a few sellers who sell items they have crocheted from my patterns, and they haven't been linked. I won't call anyone out, but I do notice. :-) I also think others notice, as well, and this reflects upon these seller's character. When someone offers free patterns with a right to sell, it shouldn't be too much to ask individuals to link back. :-) Thank you for all of those that do link back! I notice you, as well, as do others! <3 May you be richly blessed! Easy Crochet All-Night Soaker Pattern by Julie West/Crochet Diva/Fugzilla is licensed under a Creative Commons Attribution-NonCommercial-NoDerivs 3.0 Unported License. Based on a work at crochetcastle.blogspot.com. Tired of buying disposable nursing pads? These are the nursing momma's new best friend. Simple to crochet nursing pads are easily customized to smaller or larger sizes. Simply increase number of chains at the beginning, for larger nursing pads, and decrease the chains at the beginning, for smaller nursing pads. The original pattern makes an average size nursing pad. These tunisian breast pads are crocheted in sections, sort of like sections of an orange. There are five sections per breast pad. RR: Each row will include a return row (RR). To work 'RR', do the following: (YO, pull it through one loop, *YO, pull it through 2*, until you reach the end of that row. Row 1: Insert hook in 2nd chain from hook, YO, pull a loop through, work RR. Row 2: Insert hook in first tunisian stitch from Row 1, YO, pull a loop through, insert hook through next chain stitch, pull a loop through, Work RR. Row 3: Work Tunisian Stitch in first 2 Tunisian stitches from Row 2, YO, pull a loop through, insert hook through next chain stitch, pull a loop through, Work RR. Row 4: Work Tunisian Stitch in first 3 Tunisian stitches from Row 3, YO, pull a loop through, insert hook through next chain stitch, pull a loop through, Work RR. Row 5: Work Tunisian Stitch in first 4 Tunisian stitches from Row 4, YO, pull a loop through, insert hook through next chain stitch, pull a loop through, Work RR. Row 6: Work Tunisian Stitch in first 5 Tunisian stitches from Row 5, YO, pull a loop through, insert hook through next chain stitch, pull a loop through, Work RR. Row 7: Work Tunisian Stitch in first 6 Tunisian stitches from Row 6, YO, pull a loop through, insert hook through next chain stitch, pull a loop through, Work RR. Row 8: Work Tunisian Stitch in first 7 Tunisian stitches from Row 7, YO, pull a loop through, insert hook through next chain stitch, pull a loop through, Work RR. Row 9: Work Tunisian Stitch in first 8 Tunisian stitches from Row 8, YO, pull a loop through, insert hook through next chain stitch, pull a loop through, Work RR. Row 10: Work Tunisian Stitch in first Tunisian stitch from Row 9, YO, pull a loop through, Work RR. Row 11: Work Tunisian Stitch in first Tunisian Stitch from Row 10, YO, pull a loop through, insert hook through bar of next Tunisian stitch, pull a loop through, Work RR. Row 12: Work Tunisian Stitch in first 2 Tunisian stitches from Row 11, YO, pull a loop through, insert hook through bar of next Tunisian stitch, pull a loop through, Work RR. Row 13: Work Tunisian Stitch in first 3 Tunisian stitches from Row 12, YO, pull a loop through, insert hook through bar of next Tunisian stitch, pull a loop through, Work RR. Row 14: Work Tunisian Stitch in first 4 Tunisian stitches from Row 13, YO, pull a loop through, insert hook through bar of next Tunisian stitch, pull a loop through, Work RR. Row 15: Work Tunisian Stitch in first 5 Tunisian stitches from Row 14, YO, pull a loop through, insert hook through bar of next Tunisian stitch, pull a loop through, Work RR. Row 16: Work Tunisian Stitch in first 6 Tunisian stitches from Row 15, YO, pull a loop through, insert hook through bar of next Tunisian stitch, pull a loop through, Work RR. Row 17: Work Tunisian Stitch in first 7 Tunisian stitches from Row 16, YO, pull a loop through, insert hook through bar of next Tunisian stitch, pull a loop through, Work RR. Row 18: Work Tunisian Stitch in first 8 Tunisian stitches from Row 17, YO, pull a loop through, insert hook through bar of next Tunisian stitch, pull a loop through, Work RR. Section 3-5: Repeat Rows 10-18. After you complete row 18 of the 5th section, Slip Stitch through bar of each Tunisian Stitch (9 Slip Stitches). Join Slip Stitch Row with Beginning chain and Whip Stitch Together. With Long beginning tail, sew up center hole. Weave in loose ends. Attach yarn to outer edge. Slip Stitch in each stitch around. Slip Stitch to beginning Slip Stitch. Cut, weave in ends. If you are using cotton yarn, then it is a good idea to wash your nursing pads a couple of times before you use them. I've found that cotton yarns tend to be less absorbent before they have been washed a few times. For those using Merino Wool, you will probably want to lanolize your nursing/breast pads, before you use them. You can use any type of lanolin for this. Lanosil is a good brand. Simply add a pea-sized amount to a cup of warm water. Add a drop (yes, just a drop) of dish soap (like Joy). Stir mixture together, gently. You will probably notice the water turn into a milky color. This will be how you know that your lanolin mixture is ready. Place your breast pads into the lanolin mixture, and let them soak for about an hour. Place breast pads on a towel, and roll the towel up to gently squeeze out excess moisture. Remove breast pads from towel, and place somewhere to dry. Once dry, you'll have some wonderful soft and absorbent reusable breast pads! Enjoy! Tunisian Crochet Wool or Cotton Breast Pads/Nursing Pads Pattern by Julie West/Fugzilla/Crochet Diva is licensed under a Creative Commons Attribution-NonCommercial-NoDerivs 3.0 Unported License. Another easy stretchy soaker, but this one involves a few stitch changes for a more form fitting soaker. 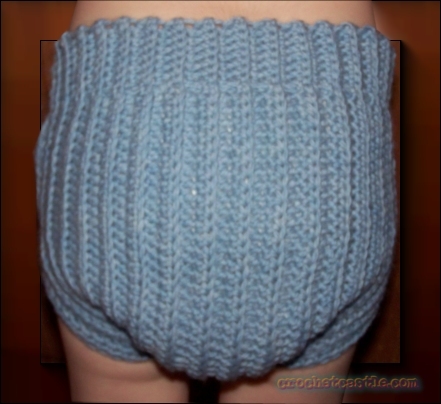 One Size Fits Most with Waistband Folded down on smaller babies. Can easily be modified for more specific sizes. Please Note: Ch 1 never counts as first stitch. Row 1: Sc in 2nd chain from hook, sc in next 3 chains, chain one, skip one chain stitch, sc in next 3 chain stitches, hdc in next 22 chain stitches, sc in next 20 chain stitches, hdc 42 chain stitches, sc in in 3 chain stitches, chain one, skip one chain stitch, sc in next 4 chain stitches, ch 1, turn. Row 2: sc in BACK LOOPS ONLY of 8 sc, hdc in BACK LOOPS ONLY next 42 hdc, sc in BACK LOOPS ONLY of 20 sc, hdc in BACK LOOPS ONLY of 22 hdcs, sc BACK LOOPS ONLY last 8 sc, ch 1, turn. Row 3: sc in BACK LOOPS ONLY of the first 4 sc, chain one, skip one sc, sc in BACK LOOPS ONLY of 3 sc, hdc in BACK LOOPS ONLY of 22 hdc, sc in BACK LOOPS ONLY if 20 sc, hdc in BACK LOOPS ONLY of 42 hdc, sc in BACK LOOPS ONLY of next 3 sc, chain one, skip one sc, sc in BACK LOOPS ONLY of last 4 sc, ch 1, turn. Row 4-33: Repeat Row 2 & 3 throughout. Finishing off: Slip stitch sides together from top stitch down 30 stitches on each side. For Draw String, I usually use a single crochet chain about a yard long. If you want something simpler, you could use a simple chain, or even double up your yarn for a thicker chain to thread through the top eyelets of the soaker. 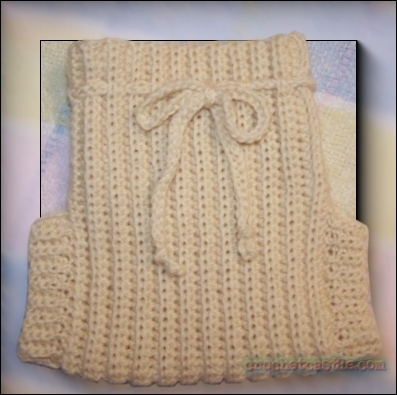 This soaker pattern is the simplest of the simples to crochet. It is very economical, as it will fit most babies from start to finish, because it is so S-T-R-E-T-C-H-Y. For newborns, you can fold down the waist. :) Even the most novice of crocheters can work it up in no time. To Finish Off, fold your soaker strip in half from left to right (Matching first stitch with last stitch). Slip stitch the sides together through 20 stitches leaving 40 stitches that are your leg holes. Repeat on the other side. For Draw String, I usually use a single crochet chain about a yard long. If you want something simpler, you could use a simple chain, or even double up your yarn for a thicker chain to thread through the top of the soaker. <a rel="license" href="http://creativecommons.org/licenses/by/3.0/us/"><img alt="Creative Commons License" style="border-width:0" src="http://creativecommons.org/images/public/somerights20.png" /></a><br /><span xmlns:dc="http://purl.org/dc/elements/1.1/" property="dc:title">Easiest Crochet Soaker</span> by <a xmlns:cc="http://creativecommons.org/ns#" href="http://crochetcastle.wordpress.com/2009/04/17/easiest-crochet-wool-soaker-pattern/" property="cc:attributionName" rel="cc:attributionURL">Julie West</a> is licensed under a <a rel="license" href="http://creativecommons.org/licenses/by/3.0/us/">Creative Commons Attribution 3.0 United States License</a>.<br />Based on a work at <a xmlns:dc="http://purl.org/dc/elements/1.1/" href="http://crochetcastle.wordpress.com/2009/04/17/easiest-crochet-wool-soaker-pattern/" rel="dc:source">crochetcastle.wordpress.com</a>.<br />Permissions beyond the scope of this license may be available at <a xmlns:cc="http://creativecommons.org/ns#" href="http://crochetcastle.wordpress.com/2009/04/17/easiest-crochet-wool-soaker-pattern/" rel="cc:morePermissions">http://crochetcastle.wordpress.com/2009/04/17/easiest-crochet-wool-soaker-pattern/</a>. Easiest Crochet Soaker by Julie West is licensed under a Creative Commons Attribution 3.0 United States License. Permissions beyond the scope of this license may be available at http://crochetcastle.blogspot.com/2009/04/easiest-crochet-wool-soaker-pattern.html. All posts on this blog are copyrighted to Fugzilla of Crochet Castle. Powered by Blogger.